The core is one of the most important parts of your whole body. It is the foundation for the strength, endurance, muscle tone, flexibility and health. Its main task is to keep your spine healthy, when you are active or inactive. Your core is working when you are sitting on your couch, lying on a bed or riding a bike. Another physical activity that requires a strong, powerful core is running. Most runners make the same mistake: they spend too much time running and neglect performing strength and stability workouts. Don't make such careless mistakes. So if you are a runner, who wants strengthen your core, we would like to show you an amazing five-minutes runner's workout. These moves will help increase core muscular endurance, improve your posture, boost running efficiency and lower the risk of injuries. Believe us, that's what you need! This core workout consists of easy exercises such as, jump taps, half burpees, mountain climbers, plank reach-unders and glute bridges. These exercises will help you strengthen your core and spine muscles! 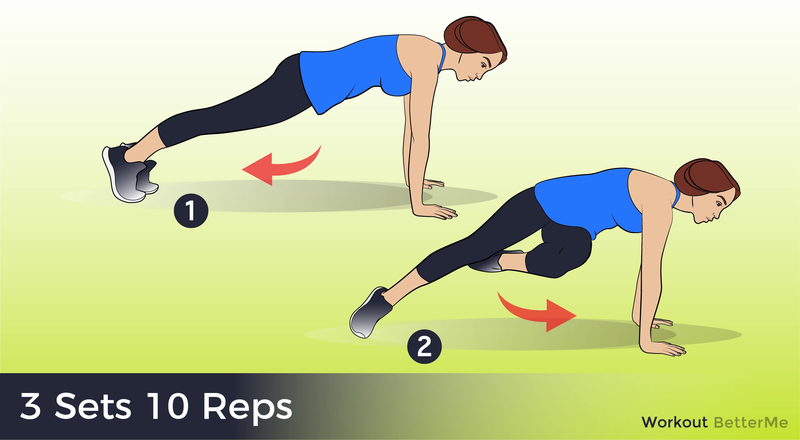 You should start with ten repetitions of jump taps, then perform ten repetitions of half burpees, do forty repetitions of mountain climbers, hold plank reach-unders ten seconds on each side and do ten repetitions of glute bridges. In order to obtain great results, you should perform at least three sets, taking a one-minute break in between each set. Are you ready to work out? Scroll down to start it right now, ladies. You can do it!